As a parent, we have expectations of what we want summer to look like for our children. If you’re like me, you want it to be filled with memorable experiences where they can have fun while they learn and create, master new skills and build new friendships. With 30 years of experience in providing quality summer learning opportunities that trigger student engagement and energize learning through real-life problem solving, a full-day camp at Bright Lights provides the right balance in all of these areas! This summer, Bright Lights will offer many exciting options for your eager student. 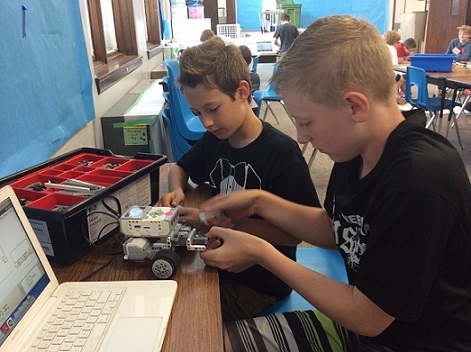 Always popular and once again returning to the summer schedule will be two Lego EV3 Robotics Camps, June 6-10 and June 27-July 1. Experienced robotics teachers will engage the students in real-life problem solving as they learn to build and program their robots. The only challenge you’ll have is getting your student to leave the classroom each day! An exciting opportunity to turn inspirations into designs awaits students who have completed 6th-9th grade in Jewelry Designer Camp, June 20-24. Taught by a Wesleyan University art professor, students will experience metalsmithing, soldering, etching, and glazing copper in a kiln as they create their own unique and professional quality jewelry. The always popular Hogwarts Camp will return June 27-July 1 filled with magical creatures, advanced potions, wand and quill skills, a trip to Diagon Alley and so much more. It’s an extraordinary experience that no one will want to miss! What would you do if a zombie contagion was spreading in our community? Human brains are being zombified right in front of everyone’s eyes...how would you respond? Students who have completed grades 5-7 can join the Zombie-CS team July 11-15 and help stop the spread of this terrible disease! Once again this summer, Bright Lights is collaborating with the UNL Department of Engineering in offering Engineering Camp July 11-15 on the UNL campus for students who have completed 6th- 9th grade. During this amazing camp, the Engineering College faculty will guide students in building robots made from discarded computer parts, creating simple lie detectors and provide opportunities for exploring civil, electrical, mechanical, computer, wind energy and biological engineering. It’s an amazing learning experience! That’s just a taste of what is to come for our 30th summer. Watch for a detailed schedule of both the full-day camps and half-day classes to come out in March, with registration starting April 1 at noon. Then get ready for your child to make summer memorable with a Bright Lights Summer Learning Adventure!